The College of Visual and Performing Arts’ Department of Drama has jumped to no. 8 on the Hollywood Reporter’s (THR) list of the “Top 25 Undergraduate Drama Schools.” For the past two years the department has been ranked no. 13; in 2012 it was ranked no. 20. “The fact that we have risen to the no. 8 spot in an international list of schools is not only a cause for celebration but a testament to the work of our faculty, staff and students; to the success of our graduates; to the value of our partnership with Syracuse Stage; and to the support of many dedicated and loyal alumni,” says Ralph Zito, professor and chair. The department offers four bachelor of fine arts degree programs in acting, musical theater, stage management, and theater design and technology, as well as a bachelor of science degree program in drama that features a theater management track. Through the department’s affiliation with Syracuse Stage, an outstanding Equity theater company located in the same theater complex, students may learn from working professionals in addition to a professional faculty. The department’s culture of rigorous conservatory-style training at a major research university with a direct connection to the profession is of great benefit to students in all of its programs of study, including the non-performance areas, says Zito. Drama students also benefit from the support of the department’s extensive alumni network. Many alumni return to campus to offer workshops or participate in discussions, while others have established more immersive experiences. 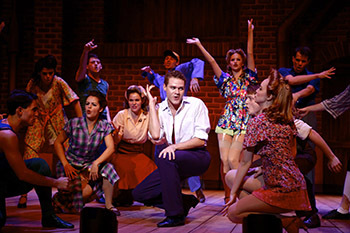 “The signature programs that contribute to the excellence of department’s training—the Tepper Semester in New York City, Sorkin Week in Los Angeles and the Araca Project, which provides early career alumni with an opportunity to produce projects in New York City—are the direct result of generous support from some of the many leaders in the entertainment industry who are drama alumni,” says Zito. While the Hollywood Reporter article mentions only a few successful alumni—Taye Diggs ’93, Vera Farmiga ’95, Frank Langella ’59, Neal McDonough ’88, Jerry Stiller ’50 and Vanessa Williams ’85—Zito knows that the list of names is almost infinite and a testament to the department’s impact on the industry. This impact includes the success of such recent alumni as Jessie Mueller ’05, Patti Murin ’02 and Josh Young ’03.